The GE Lunar DPX DUO Bone Densitometer is a compact bone densitometry system that fits nicely in an 8' x 8' room. This GE DPX DUO Bone Density system also doubles as an exam table, complete with drawers and stirrups. Perfect for the OBGYN practice that wants to offer bone density testing but is limited in space. 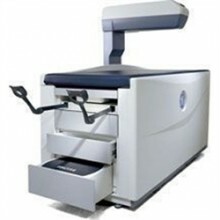 The GE Lunar DPX DUO Bone Densitometer maintains its compact nature with an arm that swings/rotates out of the way to free up the desired table space. This is a complete system. Easy to install. Patient scanning is quick and automated with SmartScan. This unique measurement technique automatically adjusts the scan path real-time during the examination. Efficient: OneScan automatically combines scans of the spine and hip into one exam; both scans are acquired in one process and evaluated in one analysis. Confident: The optional DualFemur feature automatically measures both the left and right femurs in one fast scan. DualFemur improves accuracy by identifying the femur with the lowest density. The 30%1 improvement in precision seen with the combined L/R BMD enhances the ability to monitor response to therapy at this critical fracture site. Seamless: Organization (WHO) criteria for diagnosing osteoporosis. This makes result interpretation and fracture risk assessment seamless. Detailed cleaning inside and out (system & cart). Replace any worn or malfunctioning components. Calumniator tracks are inspected cleaned or replaced. All electrical components are checked for ohm resistance repaired or replaced. Reload x-ray source: For long life and durability. Replace computer: Upgrade software to latest version of manufacturer for that model number replace hard drive, memory, CPU, mother board, power supply are replaced. Painting: Any panel that is dented or scraped is repaired and repainted. Replacing lettering: Replaced with new. New 17" flat screen monitor. Run multiple: 48 hrs. of QA’s prior to shipping. Completely bubble wrap entire system to prevent damage. Click the button below to add the GE Lunar DPX Duo Bone Densitometer to your wish list.